Twitter is for sale, specifically you can purchase fake Twitter followers; a practice that calls into question the fundamental basis of this top social media platform and by implication other social media options. Being real and transparent are at the heart of social media and engaging in practices such as buying fake accounts and shilling hurt both the social media ecosystem in general and your brand in particular. 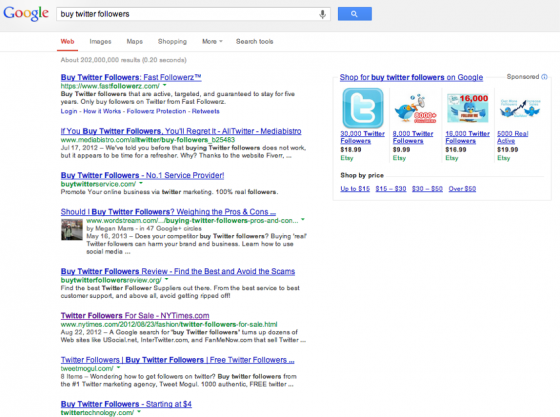 Having a large Twitter following offers a sense of legitimacy, status and popularity. At first blush, buying cheap Twitter followers in bulk seems like a quick solution to building buzz, especially for startups on a limited budget. But don’t think the public won’t find out. People watch Twitter accounts for major spikes in followers and once your public finds out, you can have a PR problem as Mitt Romney discovered during his presidential campaign. More importantly, it can be very difficult to rebuild your trustworthiness and repair your credibility, two elements that are critical on social media platforms. Research by Carlo De Micheli and Andrea Stroppa estimated that fake accounts make up 4% of Twitter’s user base. De Micheli and Stroppa calculated there were about 20 million fake Twitter followers for sale by statistically excluding overlapping fake accounts on the twelve top marketplaces. Sellers reap between $2 and $36 per fake account. Not included in this research are the people who sell the ability to get your message in front of their followers (aka shilling). Here’s what fake Twitter followers look like based on De Micheli and Stroppa’s research. 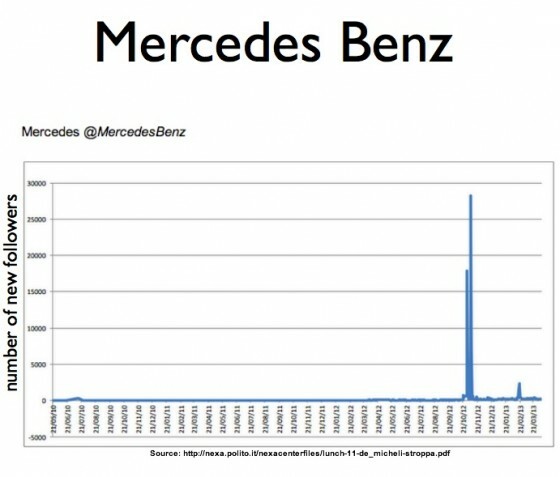 In the Mercedes Benz chart, the spikes with a large number of followers are fake. As a marketer, you need to be honest and transparent in your social media communications as with all of your marketing. Understand that if you cause followers to question the veracity of your Twitter and other social media interactions, they’re liable not to trust or purchase from you. Assuming you’re not looking to purchase Twitter followers, there’s a good chance you have some level of empty or inactive accounts following you. The reality is that most fake accounts look like no one’s home. They’re eggheads! 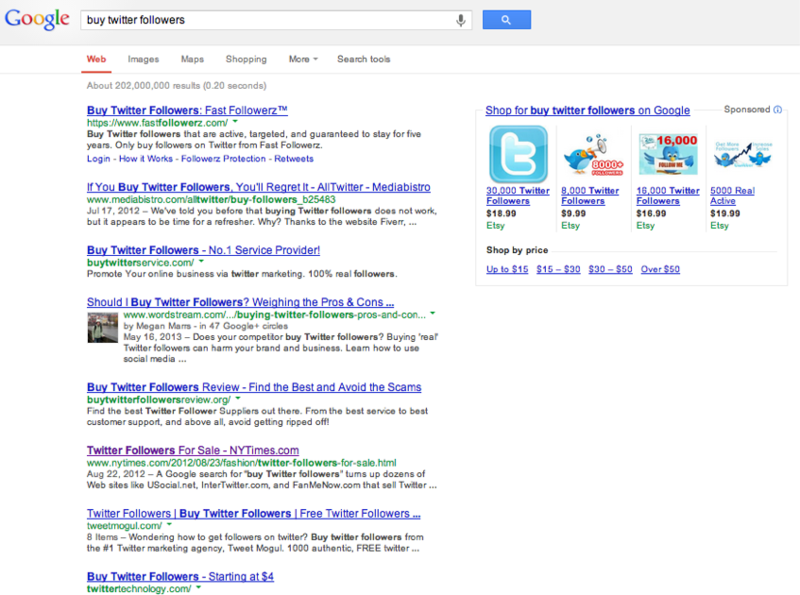 To determine if you have a problem with fake Twitter followers, use one of the free services such as Social Bakers. These automated services aren’t foolproof. Twitter accounts owned and used by real people can and do show up. While it may seem counter intuitive, getting rid of eggheads means that your messages are more effective which can help your social media ratings. 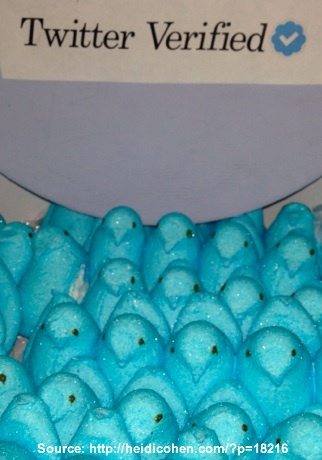 To help you develop a real following on Twitter, here are seven actionable marketing tips. Examine your goals for Twitter usage. What are you trying to accomplish with your Twitter presence and interactions? 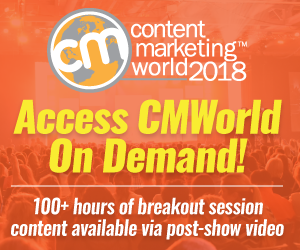 Specifically are you trying to build your brand, curate content, answer customer questions/provide customer service, support fans, offer a daily deal promotion or deliver time sensitive information. Each of these objectives requires different content and interaction. Know with whom you want to engage on Twitter. Used properly Twitter can be effective to get your message out. Are you looking to interact with prospects, customers, influencers or the public? Remember your competitors, detractors and the media are also on Twitter. So develop a social media persona to understand your target audience. BTW—according to Pew Internet, roughly one quarter of active teens online are on Twitter, although this is still significantly less than the number on Facebook. Don’t assume all of your Twitter followers have the same objective. Leverage the power of owned media to build your Twitter following. Let your audience know that you’re on Twitter and ask them to follow you there. Give people a reason to follow you on Twitter by curating high quality information. Make every tweet count! Don’t be a one-note Charlie just promoting your own content. Mix it up by offering great content on your topic to become known as a thought leader. Engage in Twitter activities. Think Twitter chats. Personally I’m a fan of #BlogChat on Sunday nights and #UsGuys an on-going free, flowing conversation. Incorporate Twitter social sharing buttons on your blog and other content. Encourage readers and visitors to share your information with their followers since this can often have a bigger impact on their followers. Twitter like other social media platforms requires that you be a real person with a human voice and emotions. It’s not about the number of followers you have but rather the quality of your followers and your relationships with them. Use Twitter as one piece of your overall social media strategy. What other Twitter advice would you add to this list and why? Why isn’t anyone listening to me on Twitter? 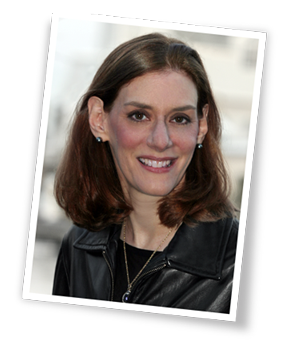 Twitter verified: (c)2013 Heidi Cohen – Right to use image as is with link to this article. No rights to modify or remix image. Tags Andrea Stroppa, Carlo De Micheli, Fake Followers, Research, Twitter. Bookmark the permalink. The surprising take away from this is that people are still buying Twitter followers. A large part of the online marketing conversation for the past few years has revolved around the lack of value in having a big number of followers unless there is an equal amount of engagement. The days when having a huge number of followers represented some sort of social proof of the popularity of your business and its services should be well behind us by now. Great article. As a new blogger you tips will help me drive more traffic and be much more effective. Liked the article Heidi. Social Baker was interesting to use – I was surprised to find we have only one fake follower… Can you share how long it took you to build your follower base ?